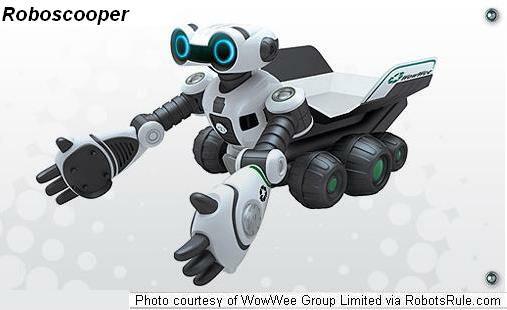 Meet Roboscooper, WowWee�s answer to Wall-E. A cute little bot with a passion for picking up items he detects on your floor, when he�s not batting them about with his hands. Roboscooper can move left, right, forward and backwards and even makes beeping noises like a dump truck when going in reverse. It has four infrared sensors for object detection and obstacle avoidance. One he has picked up an object, he can pivot his torso to drop the object in his cargo bay. If an object is too large or too heavy to be handled, he will play a message to let you know he needs help. For a really funny experience, you can put him in �whack� mode and he will smack objects that get in his way. Legendary retailer Hammacher Schlemmer has Roboscooper available for order now. Make sure you�re first in line to get your Roboscooper before the holiday season begins. Remember, Hammacher Schlemmer has a product lifetime warranty (Up to 9 years on consumer electronics) so you can buy with confidence. Use the link below to get your robotized renegade rug rate now. Roboscooper is only $69 USD. Order Roboscooper from Hammacher Schlemmer now before the first production runs sell out!